Proverbs 4:23 says that we are to guard our heart with all diligence for out of it spring the issues of life. Wow, with ALL DILIGENCE! My whole life and what I do is affected by the condition of my heart – that’s serious. It takes a conscious effort to be aware of what I am allowing to be sown in my heart. We know if we want tomatoes we plant tomato seeds and if we want pumpkin we plant pumpkin seeds, and we know that those seeds need watering and good ground to produce good fruit but how often do we look at the fruit in our own lives (or in the lives of others) and consider what seeds were sown to produce those things? Somewhere along the way, whether intentionally or not, a seed was sown. If we want good fruit in our lives like success, joy, friendships or wisdom, we need to sow the seeds that will produce those things. When a seed is sown in the ground we know it’s going to be months for that fruit to actually be seen, and even longer for it to be ripe for the picking. The roots can be going down long before even a bit of greenery comes to the surface, but any good gardener doesn’t dig up a seed without giving it adequate time to germinate. Similarly, we may plant some good seeds in our heart like listening to positive messages or music, being friendly, reading good books and learning from the wise and yet we might not see much progress in our lives for a while – but hang in there! Keep applying those good practices and good fruit will eventually be evident in your life, it’s as sure as the results of planting a seed in good ground and looking after it. Why do weeds grow so quickly?! I don’t know of anyone intentionally planting weeds in their garden but they grow there anyway! If weeds aren’t pulled out at first sight they tend to take root and spread very quickly. Similarly weeds like jealousy, bitterness, and pride can spring up in our hearts uninvited and we can tend to unintentionally through our thoughts and actions water and fertilise these weeds. This only makes them stronger and they will start baring fruit that we really don’t want – poisonous and destructive fruit. If we want to have a beautiful heart and a beautiful life, we must get rid of the weeds! If they are deeply rooted get some people who have the fruit in their life that you want to help you deal with them. My family and I like to go for walks in the rain-forest and it always fascinates me to see the various stages of strangler figs. As a strangler fig seed is dropped high in the branch of a large, strong tree it subtly sends down a root to the ground. For a number of years the host tree and the strangler fig grow alongside each other. It’s not doing any harm – the tree is as strong as it ever was. Slowly the fig starts to grow around the original tree. 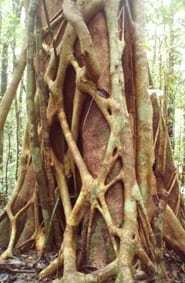 It looks quite pretty wrapped around like a braid but over time the original strong tree is strangled by the strangler fig and dies inside. How much is this like bad things in our life? So subtle, seems harmless, but eventually the part of us that we allowed to be surrounded by the weed dies. Jesus talks about this in his parable about the sower and the seed (Matthew 13:22) and it can be applied many ways. 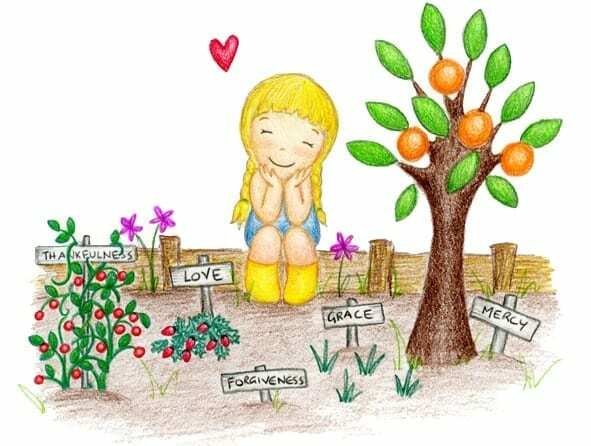 When the garden in our hearts is producing good fruit we can pass on the blessings of our beautiful heart (compassion, kindness, joy, friendship) to others and hopefully inspire them to cultivate those good qualities in their lives as well. If you would like to share a positive book about sowing and reaping with your child or friend you may enjoy our book ‘The Garden In My Heart’ and can preview via this website or download an eBook version at Smashwords and other eBook retailers. What really makes a hero? Thank you for your exquisite books. As a mum and teacher, these finds in my local post office, have been true highlights of my week! Such profound and life affirming messages, delivered in the simplest, relevant and most engaging way! The boys were given a copy of this book (A Hero Is) over the Christ-Mass period, it is absolutely perfect. This book really puts the whole “Hero” thing into perspective and teaches wonderful attitudes (A hero behaves honorably with his friends)!! !